How have I not tried this recipe before?! This is one of those things that has sat on my Pinterest board for a couple years now, and every week I look at it and then pass it over for something else. Why? I have no idea. 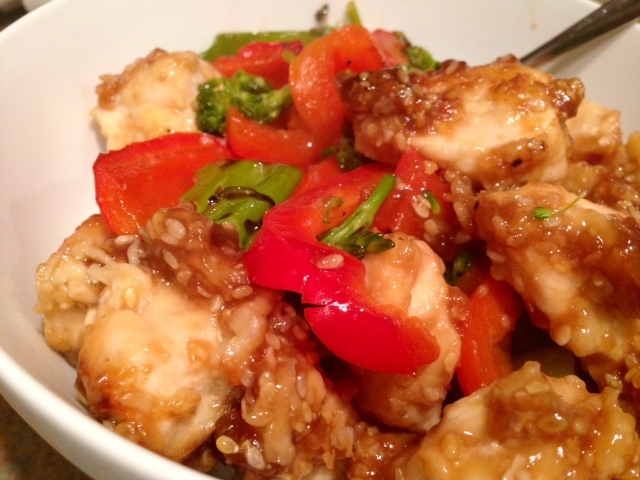 Sesame chicken is my jam when I get Chinese food. But over the winter break I decided to give it a try since it looked simple and I was already making a dessert as well. And I’m so glad I did—this recipe is simple, delicious, and mostly healthy. 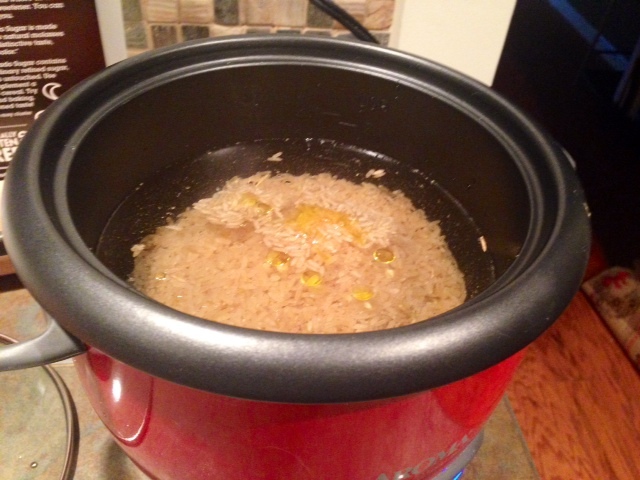 You can add whatever veggies you want and it can be ready in the time it takes to cook your rice. The one major change I’d make is to double the sauce recipe…as you can see in the picture above, there is NO sauce to spare. 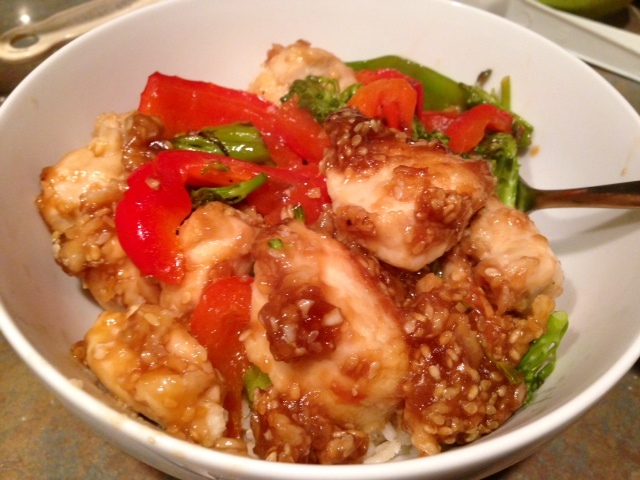 I like my sesame chicken saucy, so it can soak the rice a little, so double the sauce and you’re good to go. Set your rice to cooking. I used brown rice. Whisk the egg, 2 tablespoons of cornstarch, and a pinch of salt and pepper together in a large bowl. 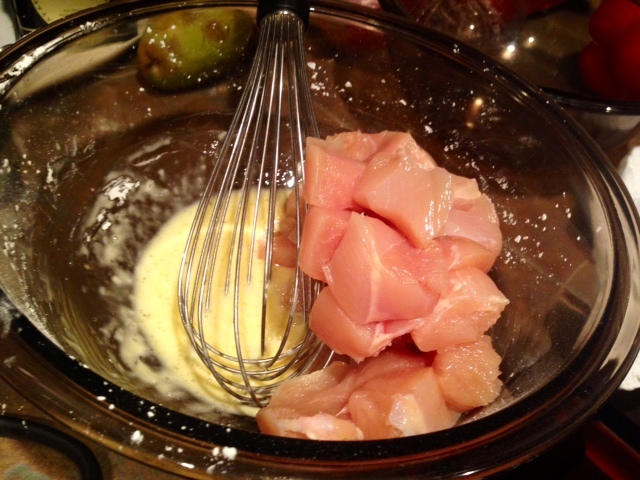 Trim any fat from the chicken, then cut into 1-inch pieces and toss with the egg mixture. 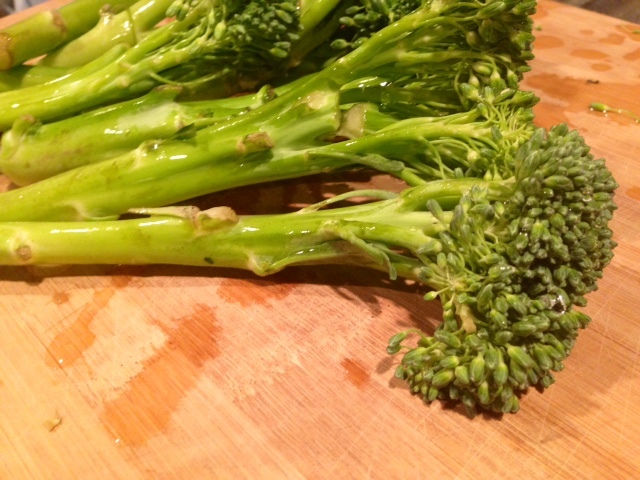 Cut up whatever veggies you’ve chosen to accompany your meal. Or forego veggies, I’m not the boss of you! 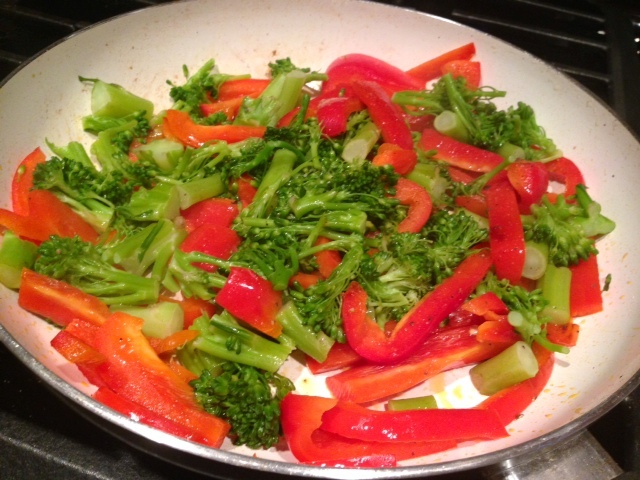 Heat a skillet on medium-high with a couple tablespoons of oil, and toss the veggies in with some salt and pepper. Stir fry the veggies for several minutes until they soften slightly, but stay crunchy. At the same time you start the vegetables, heat a large skillet with the vegetable oil over medium-high heat for the chicken. When the oil is hot enough, it’ll look kind of wavy on the surface. This is when you add the chicken and egg mixture to the pan and cook until it’s golden brown and cooked all the way through. This will take about 7-10 minutes. 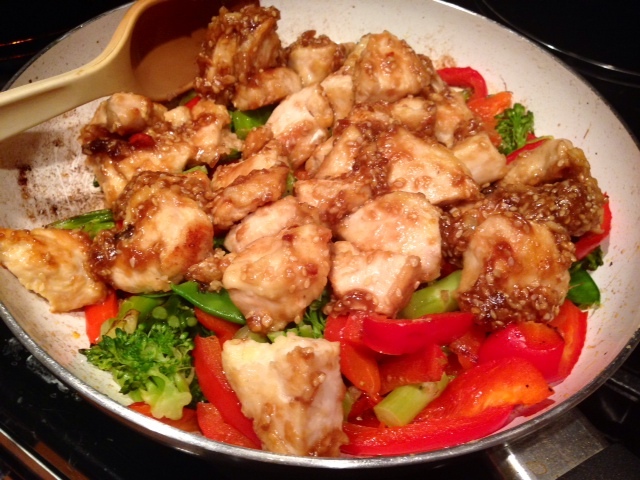 While the chicken and veggies are cooking, whisk together the sauce ingredients in a small bowl. Combine the soy sauce, water, sesame oil, brown sugar, rice vinegar, fresh ginger, minced garlic, cornstarch, and sesame seeds. Once the chicken is cooked, pour the sauce into the pan with the chicken and stir together until the sauce thickens (which it should do right away). Toss the chicken and sauce with the veggies. Serve over a bed of rice and sprinkle the sliced green onions over top (I got too hungry and forgetful at this point). In a large bowl, whisk together the egg, 2 tablespoons of cornstarch, and a pinch of salt and pepper. 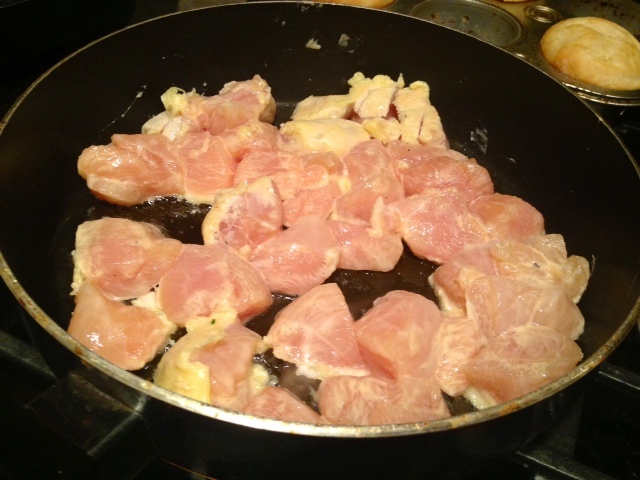 Trim any excess fat from the chicken, then cut them into 1-inch pieces and toss with the egg mixture. 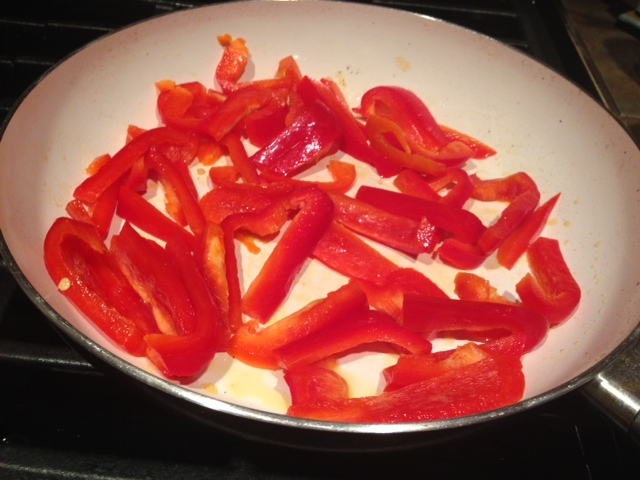 Cut up the veggies, heat a skillet (medium-high) with a couple tablespoons of oil, and toss the veggies in with some salt and pepper. Stir fry the vegetables for several minutes, stirring occasionally, until they soften slightly (but retain their crunch). Set aside. At the same time you start the vegetables, heat a large skillet with the vegetable oil over medium-high heat for the chicken. When the oil is very hot (it’ll look wavy on the surface), add the chicken and all of the egg mixture. Cook, stirring occasionally, until it is golden brown and cooked through. This will take about 7-10 minutes. While the chicken is cooking, prepare the sauce. In a small bowl whisk the soy sauce, water, sesame oil, brown sugar, rice vinegar, fresh ginger, minced garlic, cornstarch, and sesame seeds together. Once the chicken is cooked through and golden brown, pour the sauce over top. 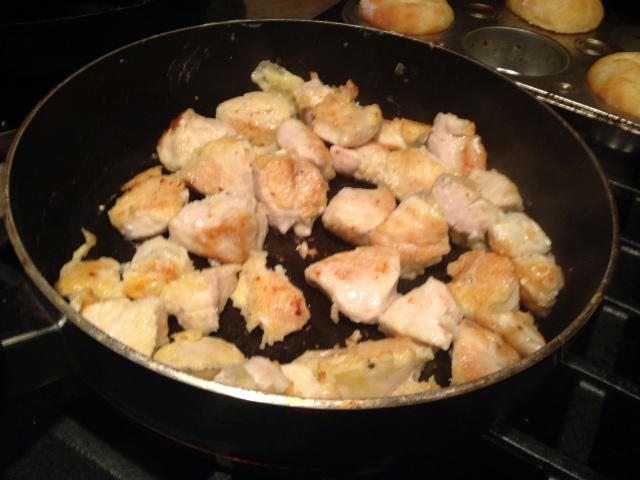 Toss the chicken to coat in the sauce, which will begin to thicken as soon as it hits the hot skillet. 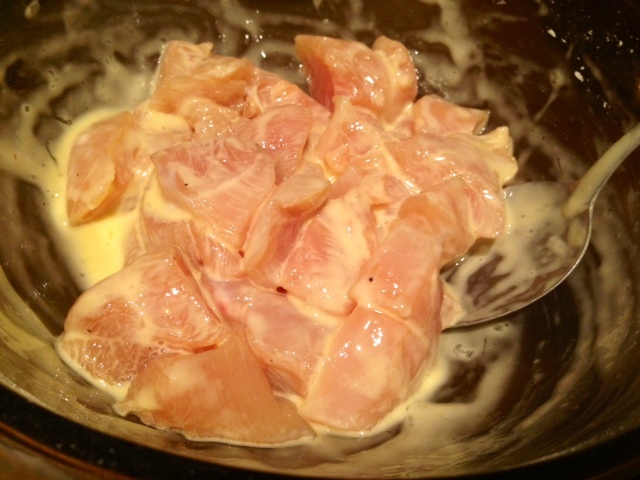 Once the chicken is coated and the sauce thickened, turn off the heat. Serve over a bed of rice and sprinkle the sliced green onions over top.